Saw this on Pinterest and I like the simplicity and wisdom of it. 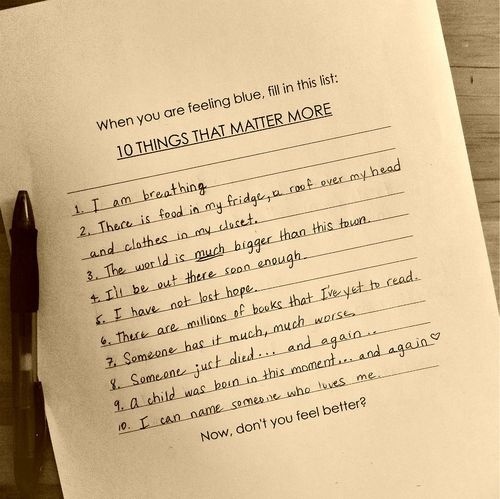 What if every time something worried us or was bothering us or getting us down or we lost something or found out some one didn’t like us or felt looked over, passed by or under-appreciated, what if we made a list 10 things that mattered more than that hopeless feeling? Sometimes life is just hard, sometimes bad things happen to good people. Sometimes we even get what we deserve (it’s all a learning process, isn’t it?). You don’t have to have been born with a sunny disposition or perfect perspective – you can develop it! Gratefulness is a skill, like anything. Here is a great way to practice that until we become expertly skilled in it! Things that matter more: go!